With twenty years and four previous albums under their belts, New Jersey’s Spider Rockets are far from a new act. In fact, their approach to rebellion and rock ‘n roll is one that’s firmly rooted in the past. 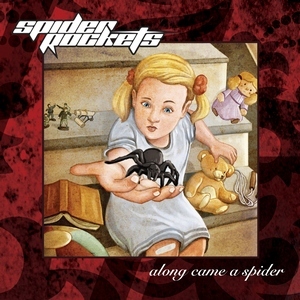 But it hasn’t kept them stuck there, with their fifth album Along Came a Spider being a showcase for an amalgamation of classic rock and hard rock (with some occasional punk attitude) that can just as easily stand with more modern giants. The bottom line on Along Came a Spider is that it personifies fun and engaging rock ‘n roll at its finest. They can channel the olden days (such as the enjoyable and fitting cover of Pat Benetar’s “Heartbreaker”) but can include a more modern and contemporary vibe to stay relevant. And with a compact timeframe that never slows down, it’s a suitable ‘crank it with the windows down on repeat’ type release.